Originally known as the MGM Grand Garden Special Events Center, the MGM Grand Garden Arena is a premier Las Vegas event venue. Located inside the renowned MGM Grand Las Vegas Hotel, the Arena is known for hosting several famous and highly anticipated boxing events, including Mike Tyson vs. Evander Holyfield and Floyd Mayweather vs. Manny Pacquiao. In addition to concerts, award shows, and sporting events, the MGM Grand Garden Arena can also be booked for private events. Offering 100,000 square feet of event space, it can be transformed in a variety of ways to accommodate any type of special event, from a welcome reception to a formal dinner to a conference. The MGM Grand Garden Arena can seat up to 17,000 guests and both the first floor and concourse level can be used – separately or together. The first floor offers 49,481 square feet of usable event space, while the concourse offers an additional 55,195 square feet. The MGM Grand Las Vegas Hotel also offers a variety of event spaces that can be used in addition to the Arena. If you’re hosting a variety of events over the course of several days, the MGM Grand Hotel is a perfect choice, as attendees can stay on-site and simply walk to all of their events each day. With 5,000 hotel rooms, a variety of renowned restaurants and shops, plenty of entertainment options, and several different pools, MGM Grand offers something for everyone. The hotel also has its own nightclub, Hakkasan, where the OTS team has experience producing events. The MGM Grand Hotel is home to more than 600,000 square feet of event and meeting space, and won the Pinnacle Award from Successful Meetings Magazine 11 consecutive years. MGM Grand Conference Center – Offering 380,000 square feet of event space across three different levels, the conference center can accommodate everything from small meetings to large conferences. It also has several boardrooms that are perfect for breakout sessions. Marquee Ballroom – The Marquee ballroom is ideal for galas, reception, and large-scale formal dinners. With 90,000 square feet of event space, it can accommodate over 6,000 guests. Studio Ballroom – Centrally located within the hotel, close to shops and restaurants, the Studio ballroom is 10,000 square feet and accommodate up to 900 guests. 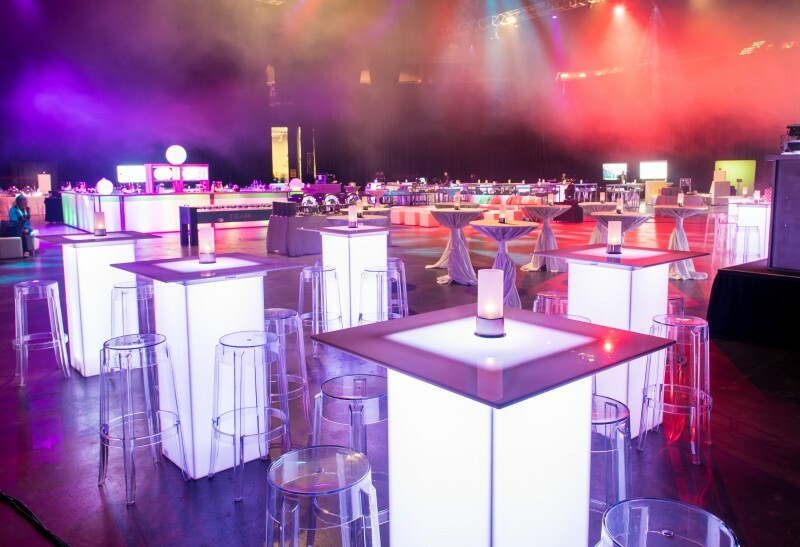 On The Scene is an award-winning Las Vegas event management company with experience producing one-of-a-kind corporate events at the MGM Grand Garden Arena. We have produced events for companies in a wide variety of industries and can handle any type of event – no matter the size or scope. Our team of experienced event professionals will work with you every step of the way, learning your corporate culture and event goals to produce an event attendees will remember for years to come. We work as your behind the scenes partners, handling everything from the initial logistics and planning to transportation, dining, and production. Interested in hosting an upcoming corporate event at MGM Grand Garden Arena? Contact On The Scene today!